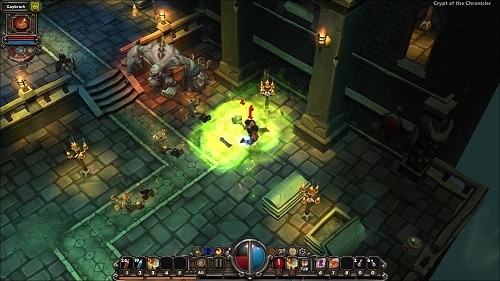 Torchlight was developed by Runic Games and released in 2009, eventually making its way to Xbox 360 in 2011. 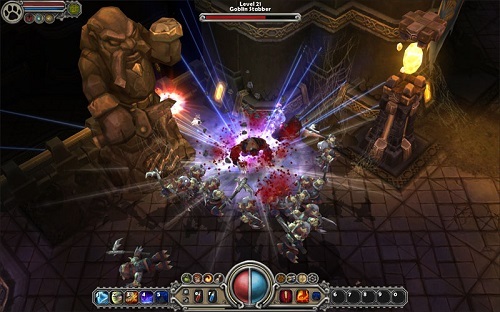 The game is a single player action RPG that is very similar to the Diablo series in terms of gameplay. The setting for your adventure is the town of Torchlight, a mining town built on top of a rich vein of mysterious Ember. Players play as an unknown adventure that arrives at the town in search of adventure and fortune. You are quickly recruited by Syl to find his mentor Alric in the caves below the town. Players have the option of three different classes in Torchlight that each have their own skills and preferred play style. Players can choose from the Destroyer (a melee specialist), the Vanquisher (a ranged weapon user) and the alchemist (a spellcaster/summoner). Each level of the caves and dungeons that players explore are randomly generated and feature a variety of monsters just waiting to be slain by your hand. Loot in Torchlight is also randomly generated making each new loot drop as exciting as the last. As players venture deeper and deeper into the caverns under the city of Torchlight a variety of quests will open up along with various bosses. Side quests and random events will also pop up from time to time to make the game world feel more dynamic and realistic. Gamers familiar with the Fate series of action RPGs will recognise the pet system in Torchlight. Your pet will help you fight, can carry items and even return back to town on your behalf which makes it very easy to avoid returning to town and stay in the action. You can even feed your pet to transform them to boost their stats temporarily. As a single player casual alternative to Diablo you can’t look past the original Torchlight, you are guaranteed to get hours of gameplay for a great price. A casual single player action role playing game. 3 different classes to choose from. Choose your own pet to follow you around and run errands in town for you. Catch fish to boost your stats and your pets. Randomised levels and items makes for endless replay potential.